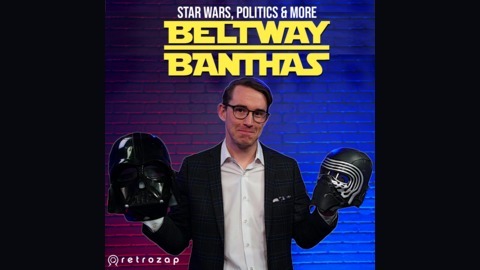 Beltway Banthas is a weekly Star Wars podcast about the intersection of fandom and politics. For hosts Stephen Kent & Swara Salih, one of those things is politics. Star Wars draws from our worlds politics just as much as it contributes to it by influencing policy makers, journalists and thought leaders. On this podcast we seek to understand how Star Wars impacts the world we live in, while also covering the Star Wars news, gossip and hype of the day. Hello Banthas! 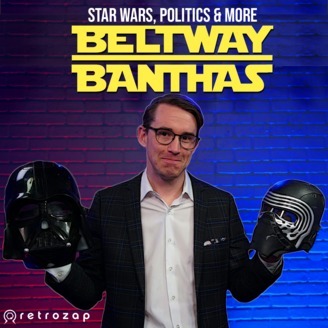 Since it's launch in 2015 during the heat of the presidential primaries for 2016, Beltway Banthas has been a proud home of political discourse within Star Wars fandom. We've featured prominent politicians, journalists and political operatives on the show to explore how Star Wars impacted their worldview and careers. 70 official episodes and well over 120 episodes including interviews and bonus content. This...is the last fodder. Join host and creator Stephen Kent, alongside producer John Liang and Joe Tavano of the Retrozap podcast network for a discussion of the shows central themes. The Force of Star Wars' politics is strong. Let's discuss!